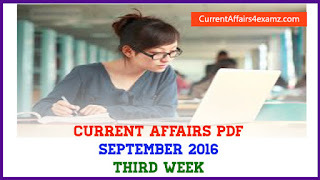 Hi Aspirants, here is the Current Affairs Quiz for 15 September 2016 useful for upcoming IBPS RRB, PO, Clerk 2016 & other competitive exams. 1. International Day of Democracy was observed on? 2. Name the Indian-American physician-author who was selected for the prestigious 2015 National Humanities Medal? Note: President Barack Obama will bestow the honour upon Verghese along with 11 others recipient’s at a ceremony to be held in Washington on 21st September 2016. 3. Which company has recently signed a deal with Maxis Communications Berhad (MCB) for merger of wireless businesses of Aircel Limited with itself? 4. Name the Indian who was recently ranked second in Fortune’s ’50 Most Powerful Women International’ outside US? 5. Name the India-born innovator and scientist who has recently won the prestigious 2016 Lemelson-MIT Prize? Note: In the final match held in Greater Noida, India Blue defeated India Red, captained by Yuvraj Singh, by a massive 355 runs. 7. Name the colour of the ball used during the 2016-2017 Duleep Trophy Cricket tournament? 8. Hindi Diwas is celebrated every year on? Note: Hindi Diwas commemorates the day when the Constituent Assembly of India accepted Hindi as the official language of the country along with English. The listing of Hindi as official language took place on September 14, 1949. 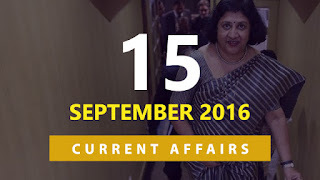 9. Who was honoured with ‘Tamil Ratna’ award by America Tamil Sangam in September 2016? Note: He was bestowed with this award for fighting corruption and working for more transparency in the functioning of the government. 10. Devendra Jhajharia has recently won the gold medal for India in the Paralympics 2016 in which event? Note: With this, he becomes only the second gold medallist at the Paralympics for the country. He won the gold medal with world-record throw of 63.97 metres.